Jacob Lommers (1696c1775) was born in Gulick, Germany but as a soldier moved to Utrecht in 1715. There he set up shop where he produced optical instruments, including telescopes and microscopes, for Utrecht University. At various time in his career Lommers worked in the Theatrum Physicum at the University, or for the City of Utrecht (1743) to maintain their astronomical instruments. Lommers' microscopes included hand-held and mounted screwbarrel magnifiers, as well as compound microscopes patterned after those built by John Cuff. Unlike other Cuff copies of the time, however, the microscopes of Lommers varied widely, having different focusing mechanisms, different body shapes, and different support pillars. This microscope in the Golub Collection is signed on the body tube: "Jacobus Lommers, Fecit Utrecht 1767 AE:T. 71." The inscription would indicate that Lommers made this instrument in Utrecht, Holland when he was 71 years oldwhich would set his date of birth at 1696. The microscope body is supported by a double, square support pillar via a curved brass limb fixed to the top section. Focus is via rack & pinion. The lower, fixed pillar is the rack. The pinion focus knob is attached to the top pillar, which moves the microscope body when focusing. The main support is fixed to the base with a tapered dovetail. A gimbaled mirror press-fits into a hole in this support base. 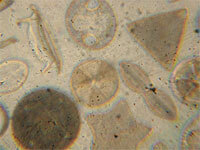 Optics are the typical three-lens system (eye lens, field lens, objective). Like the Cuff, this microscope has no drawtube. There is only one objective with this instrument. It is marked with a "5". The brass stage is fixed to the main support pillar. It consists of a base with a recessed circular hole in the middle, and a thick circular top piece. Placement of the top piece is via four locating pins. When assembled it probably retained a circular glass plate (missing). There are no accessories. The microscope and pillar are mounted on a solid, tiered wood base. It is octagonal in section, 18.5cm wide x 7.5cm tall. Except for a mahogany bottom piece, the base is made of oak. It is probable that the base was added well after the date of manufacture. While other Lommers compound microscopes have a similar brass pillar foot, they are mounted on a rectangular storage box. 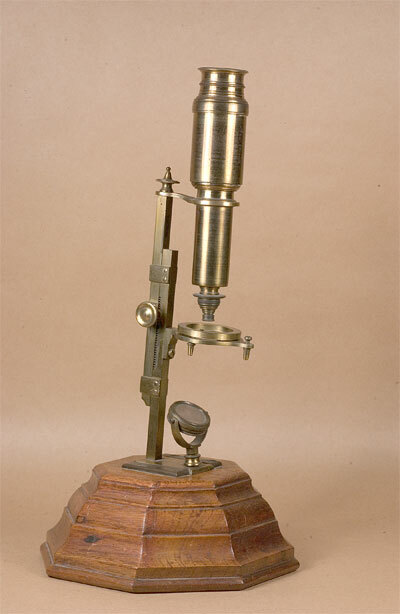 It is unusual to have a microscope of this era mounted on a solid base, with no capability of storing accessories or extra objectives. The body tube is 19cm in length, and the complete assembly is 32cm tall. The Museum Boerhaave has three Lommers compound microscopes (7289, 7204, 10133). All are mounted to a storage box. This microscope was featured 05/2008.